Sunday afternoon features a premier NFC vs. AFC matchup as the Denver Broncos host the Dallas Cowboys at Sports Authority Field. Both teams are coming off important division wins and have the look of playoff teams. Vegas pegs Dallas as a point and a half favorite in what will likely be a slug fest that features high level defenses. Points will be at a premium and fantasy totals may be low. 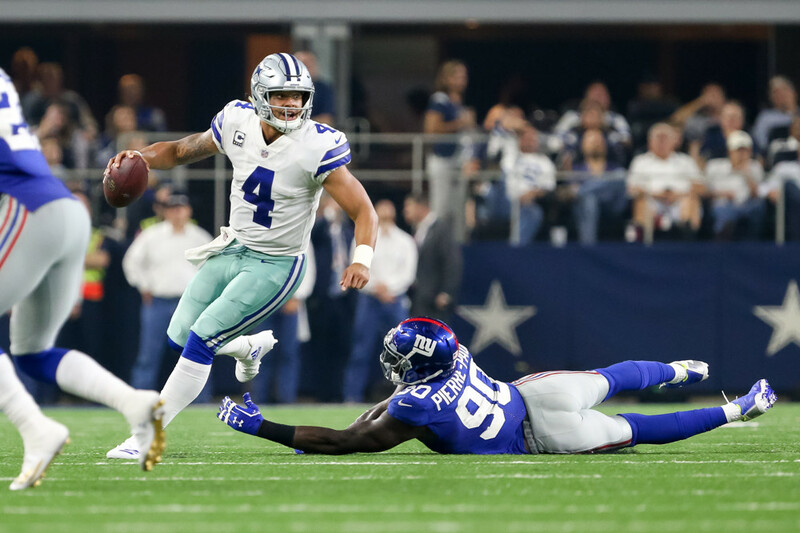 Dak's week one performance against the Giants is what we have come to expect from him early in his career. Despite a pass heavy game plan (39 attempts) he is not going to put up gaudy fantasy numbers. Instead he'll be consistent and take care of the ball. In week two he faces the premier pass defense in the league in the Denver Broncos and will likely run a conservative game plan. Look elsewhere for a better matchup out of your fantasy QB. Ezekiel Elliot's off the field triumph paid immediate dividends for fantasy owners as he posted 140 total yards and accumulated five catches. He faces another stiff front in the Broncos, who despite finishing 28th against the run last year, limited Melvin Gordon to only 58 yards rushing. Regardless, he is a must start. The league is appealing the legal decision but Elliott looks like a go for week two. And if he is, he should be in your lineup. Despite a team high 9 targets, the Giants were again able to limit Dez Bryant to a minimal output, only two catches for 43 yards. This week, Bryant is in for even tougher sledding against Aqib Talib, Chris Harris, and the Denver pass defense. Consider him a WR2 or Flex play and hope for a big play score. He's still doing it. Witten led the team in receptions (seven) and scored the only touchdown for the Cowboys in week one. But anyone who now views Witten as a TE1 is likely to be disappointed for the rest of the season. He is a poor choice against the Denver pass defense and will likely only garner a few targets. Cole Beasley turned five targets into three receptions for 32 yards in week one, although his behind the back catch probably should have counted for two. Beasley will occupy the three to six catch space all season and should only be in flex consideration in very deep leagues. Trevor Siemian turned in a top four fantasy quarterback performance in week one, looked in control of the offense all evening and flashed some impressive mobility (RIP to Joey Bosa's ankles.) Dallas is vulnerable to the pass (26th in pass defense last year) and has struggled pressuring the quarterback so Siemian is a stream-able option if you are in need of a quarterback. Finally healthy again, C.J. Anderson logged 20 carries for 81 yards and would have had an even better day if not for a penalty on a third quarter touchdown run. He looked quick, decisive, and physical. The Cowboys run defense was tops in the league last year but Anderson's workload makes him a solid RB2 for this matchup. Demaryius Thomas is usually going to get his, regardless of the defense or who is under center for the Broncos. Dallas doesn't have a good pass defense and Thomas should be able to exploit their secondary. He has an extremely high floor in this matchup with the ability to produce WR1 numbers. Emmanuel Sanders had an uncharacteristically quiet night against the Chargers, but was about 8 inches away from a long touchdown that would have made his stat line a lot more desirable. With an injury to the Cowboys' Orlando Scandrick, Sanders will be WR2 who should see plenty of action. Yes, Bennie Fowler III scored two touchdowns, but don't expect a repeat performance in the near future. Fowler barely deserves roster consideration, let alone being in your starting line-up. There will need to be more consistent targets for Fowler before he makes your team.